How appropriate a lyrical theme this one is for this artist at this particular time in rock history. It’s almost as if Ivory Joe Hunter was clairvoyant as to our job at hand here on Spontaneous Lunacy a full seven decades before we even existed and wrote this song for our benefit to show just how difficult a task we have at times when deciding what gets included here. It also happens to show just how tenuous rock ‘n’ roll’s forward progression was in its earliest years, when a slight shift in approach might send the entire style off in another direction, destined to be absorbed into something else altogether rather than become the defining music for a specific cultural outlook that would last well into the next century. Hunter’s conflicting stylistic choices need no lengthy review here, providing you’ve been reading this blog from the start (if not, what are you waiting for? There’s no charge!). While the ebb and flow of rock as a whole has been fairly predictable, with the music taking awhile to work out the kinks before making some big leaps forward, Hunter has been largely stuck in place, taking small steps and doing just enough to keep in sight, yet with one exception – Pretty Mama Blues – making no real headway on getting to the middle of the pack, let alone at the forefront of the music. That trend unfortunately continues here, yet it also shows why that was not quite a problem for Hunter whose versatility and overall skills – as a songwriter, pianist and singer – virtually assured him of a receptive audience. The problem of course was WHICH receptive audience would find him each time out. An older more content brand of music fan who had no input into the rising popularity of rock, soon to see their own influence on the trends of the day start to wane, or would it be with the younger more fickle, yet more passionate, rock fan who was already starting to assert their tastes and in the process were shaping the future of music in more ways than most thought was possible. We’re never sure from one release to the next which road Hunter would take, probably because he himself was never quite sure either. He could, and did, try his hand in any conceivable style at one point or another and did it all with enough competence to be rewarded commercially for much of it and appreciated artistically at the same time. It might not always be the same audience applauding his output from one record to the next, but somebody out there was bound to find something of merit in everything he did. The flip side of this record is proof of his foresight in that regard actually. Entitled Don’t Know it is a mock-calypso number that is like the prototype of what made Harry Belafonte famous a decade later. Who knows what might’ve happened had the broader audience that was captivated by Belafonte had heard Ivory Joe’s efforts in 1949 and reacted in the same way. Would Hunter have built a career around that approach, selling millions of records and becoming a cross-cultural star in the process? It’s doubtful. Not because he wasn’t capable of churning out excellent originals in that motif as well, or even the fact he didn’t have Belafonte’s dashing looks to help add visual appeal to the image that went with the music, but rather that Hunter was too artistically restless to ONLY stick to that style for long. Even if it had been successful he’d have likely moved on to something else before the record stopped spinning. That’s just how he was, Hunter had ants in his pants when it came to music, wanting to try everything under the sun. That becomes clear when flipping the calypso experiment over and hearing In Time on the other side. Though both are instantly recognizable as Ivory Joe Hunter songs, even with the vocal accent he used on the island-based song replaced by his own mellow tones here, they’re not of the same ilk. Whoever was the potential listener for one side was probably not the target for the other and that remains both his strength (musical diversity) and his weakness (stylistic uncertainty). Truthfully this record was a late addition to the roll call of rock sides here, included primarily because Hunter would go on to focus more consistently on rock ‘n’ roll as its popularity flourished, and so it’s important to see how he got to that point. Besides it’s not completely alien to what we’ve encountered so far and even has a vaguely prescient feel to it that I can’t quite put my finger on but it has some unsubstantiated connection to future rock songs in how it’s arranged. As probably could be expected based on his recent commercial success with King Records with songs bordering rock and more of a genteel pop slant, Hunter offers up something in that same vein here with In Time, but not simply a carbon copy of anything that he’s done before which makes it even harder to find a suitable home for. The piano is a bit more prominent than we’re used to from him in the opening, his left hand setting a slowly swinging rhythm which is kinda nice, fairly catchy, yet not exactly edgy. The horns, trumpets of course, pull it towards the pop world, but they’re only playing responsorial accents, not carrying the main thrust of the song, leaving its allegiance in limbo. In fact the most shocking moment comes when the instrumental solo comes along and it’s neither the horn, as I’d have expected, or the piano, as I’d have hoped, but rather a guitar playing a lazy riff with a distinct south of the border feel. Nothing else about the arrangement or thematic content hints at that setting, but somehow it fits nicely into the song. Lyrically Hunter shines here, which is something we’ve frequently suggested was his strong suit, yet rarely were able to offer any clear-cut evidence of it in the songs we’ve encountered along the way. Not so this time, as the lyrics reveal a well thought out storyline highlighting his internal conflict over a girl he can’t seem to commit to. That’s also entirely appropriate for Hunter’s musical mindset at this point. Substitute the subject of a girl with rock music and it’d make for an entirely autobiographical study of a man given to wandering through every conceivable musical style. In the story he ACTUALLY is presenting, that of telling a girl he’s not about to settle down with her as she hopes, he manages to maintain a conciliatory tone without actually changing his mind and giving into her. He’s pacifying her with his warmth, even as he’s telling her he’ll be gone in the morning, which is of course not the easiest thing to pull off if she sees it for what it is (her being dumped) rather than what he’s suggesting (him being compelled to go). It’s a masterful performance in that regard, soothing in its cadences, delivering the strong melody with laid-back assurance. Though not the best record we’ve heard from Hunter it’s arguably the best vocal he’s delivered, one that’s highly addicting, almost lulling you into a drowsy acquiescence of what he’s saying, all while your common sense is aware he’s breaking your (her) heart. If you go by surface appearances there’s probably not much here that connects this with the dominant image of rock. Even the piano which in the future on songs of this tempo would be reliant on triplets, is playing no such thing here. But somehow it fits all the same. I can hear hints of Elvis Presley’s vocal style on similar “rock-a-ballads” during this, as well as The Everly Brothers, Al Green, Marty Balin of Jefferson Airplane, even Bob Marley, all of whom intuitively knew how to ease back on their deliveries at times, letting the flexibility of their voice alone add subtle shadings that caused listeners to lean in expectantly for fear of missing something. Like I said, it’s not anything specific as much as it is a feel, something not quite definitive but perceptible all the same – to my ears anyway and I hope to yours as well. I suppose if you get right down to it this more of a charming performance rather than a captivating one. A lesson on subtlety, lightness of touch and a less is more approach to the musical side of the equation. For once with Hunter there’s nothing that could be picked apart as not belonging here. There’s no radically outdated ideas, even though to be honest there’s also not anything that’s really forward looking either. As such In Time seems to exist in a bubble, almost untouched by time, seemingly belonging to no era completely. The trumpet may suggest otherwise to some, usually to me too, but not here where it sounds subdued and entirely fitting. Everything meshes together well and leaves you humming quietly along. That’s hardly a description that rock music was used to – in 1949 or any time since – but there’s always been a subversive undercurrent of mellow introspection that pops up from time to time in rock’s history reminding one and all of the need to balance out the moods and perspectives. They may not always be the best bet for a hit – this one wasn’t despite Hunter’s recent chart success – and most songs like this may not be widely known or even universally loved, but their presence speaks to something more enduring about the mindset of listeners who occasionally like to pause to catch their breath, as well as the creative approach of the artists who every once in awhile take their foot off the gas pedal for a moment. I could be way off, I probably am, but what doesn’t change is the impact this song makes. Atypical for the rock scene at the time… leaning towards pop without giving itself over to it… emblematic of Hunter, yet without the artifice of intentionally conforming to his own signature attributes. Mild, like Hunter himself, but a recommendation nonetheless. I’m surprised some country-and-western act didn’t cover this in the late 40s for a big hit on Billboard’s folk charts. This sounds like it would’ve been a 10-week chart topper for Eddy Arnold or Bob Wills’ Texas Playboys with Tommy Duncan singing lead. Anyway, I’ll co-sign on a “5” simply because I can’t figure out what this song is supposed to be besides rather pleasant. 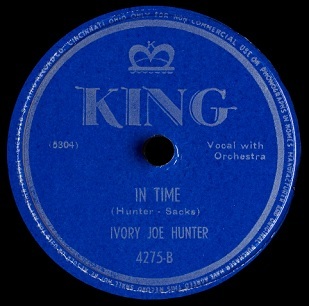 Leave a reply on "Ivory Joe Hunter: “In Time”"